If you have always liked the thought of appearing in panto, here is your chance. Queens Park Arts Centre has announced its pantomime for this year will be a new adaptation of Pinocchio. And open auditions will take place in June. Written and directed by Dario Knight, the panto will run throughout December at the centre’s Limelight Theatre and will once again feature a cast of local actors, as well as sets, costumes, puppets and props designed and produced by the centre’s creative team of artists and makers. Students of the Susan Diane School of Dance will also join the production. 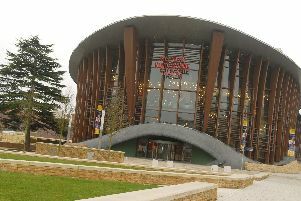 Since returning in 2011, the Queen’s Park pantomime has become a hugely popular festive fixture in Aylesbury Vale. Last year’s show, Alice in Wonderland, broke box office records for the venue, with over 1,800 people seeing the production. Pinocchio will tell the story of Fairy Celestia granting old Geppetto’s wish for a son by bringing his treasured puppet to life. But there is danger afoot as dastardly Mangiafuoco, ringmaster of the travelling toy circus, plots to steal the little wooden boy to become his new headline act! Ticket prices start at £13 for adults with concessions available. See www.qpc.org or call 01296 424332 to book. The website also includes full details of the audition process and the parts being cast. Actors aged 17 and above of all levels of experience are invited. The auditions will be held at 11am on Sunday June 4 and Sunday June 11 and at 7pm on Monday June 5.